It claimed that a simple modification of a URL exposed the site's entire database. "Alter one of the parameters and you have access to EVERYTHING: users, activation codes, lists of bugs, admins, shot, etc." The screenshots showed the attack was focused on Kaspersky's technical support and knowledge base for the Americas. It included the names of more than 150 tables. The URLs were edited to redact the page's vulnerable handler, but tools that are easy to come by could help anyone who knows how to use them to identify where the SQL injection weakness is located, Ptecek said. 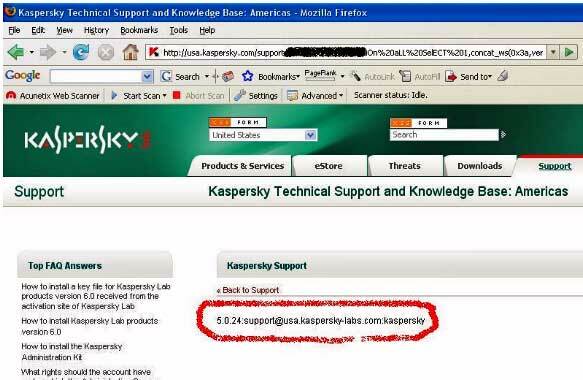 Assuming the hack is for real, it wouldn't be the first time a Kaspersky site has been hit by a SQL injection attack. In July, Kaspersky's Malaysian site and several subdomains were defaced by hacker who left pro-Turkish slogans. According to ZDNet's Zero Day blog here, Zone-h archives show 36 website defacements of international Kaspersky sites since 2000. This breach appears to be more serious because it potentially exposes customer information and could also open Kaspersky's site to other types of abuse, security experts said. "I hope that Kaspersky administrators fix this vulnerability rather quickly as they no doubt have a large customer base, and it would appear that all those customers are now exposed," Gunter Ollmann, the chief security strategist at IBM's Internet Security Systems blogs here. "On top of that, this type of critical flaw can probably be used to usurp legitimate purchases and renewals of their products - which could include the linking to malicious and backdoored versions of their software - thereby infecting those very same customers that were seeking protection from malware in the first place."